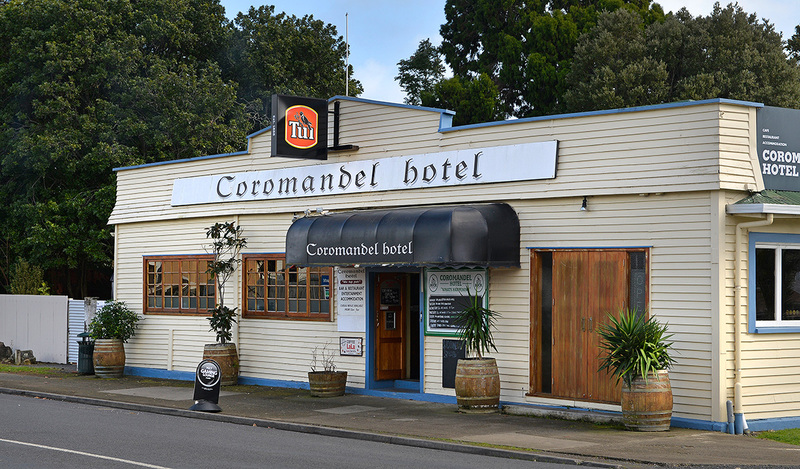 As we passed the Coromandel Hotel, I remembered being told about some parking for Motorhomes that was available behind the pub. It is not marked on any of the apps and doesn’t appear in the bible so it was time to check it out. I’ll be trying it next time we’re there. It looks nice. In terms of being in the middle of things, this NZMCA park takes the cake for being handy to everything. Great restaurants, several pubs, lots of history and things to do. 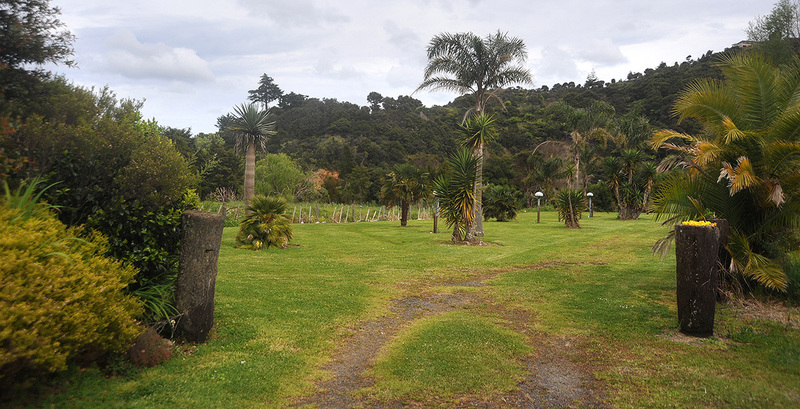 It is in Coromandel and is just behind the BP station as you come into the town on the left. Blink and you’ll miss the entrance. 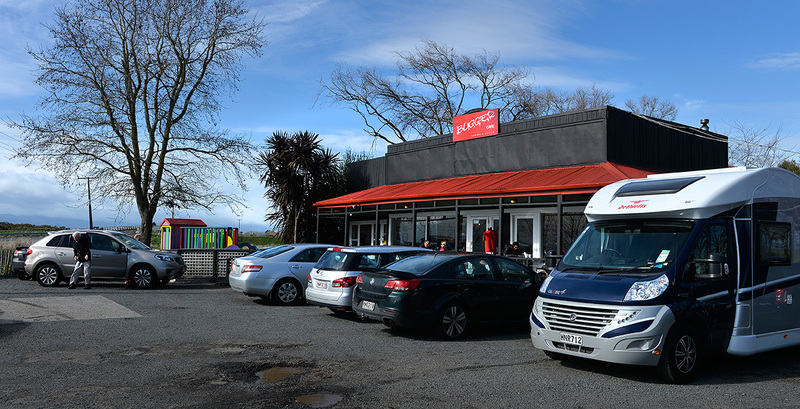 Its is also very conveniently right behind the Coromandel Smoking Company where you can buy everything from smoked fish and other seafood to great cheese from local cheesemakers. I have been here in the middle of winter when it had been punished by endless rain and many were camped in a small area of gravel by the entrance. I gather the local managers of the park have a solution to the water problem in winter and there are plans to make it more all weather. Our two nights there were great and there were about a dozen other motorhomes and caravans who came and went while we were there. Our first day there, we had lunch at the local pub with friends Rob, Helen and Chloe. Fiona and I shared a seafood basket for $16 which was amazing with bits of everything along with a nice glass of wine. We decided it was so nice we had to go back later to watch the rugby.. the one with the controversial try! … A great night and an interesting game. Rob, Helen, Chloe and Fiona behind enjoying lunch at the pub. The next day, we checked out Driving Creek Railway which is just up the hill from the town. 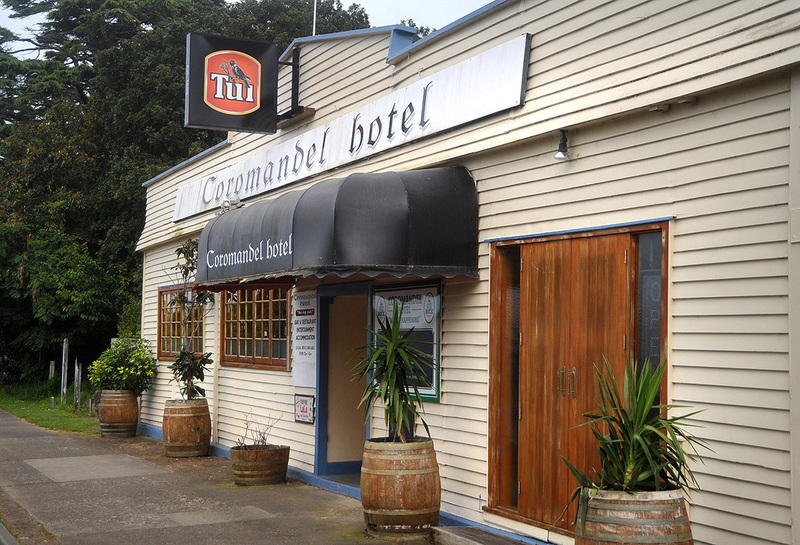 There is so much to see and do in Coromandel. 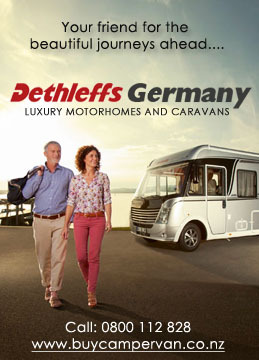 It is so well setup for Motorhomes too and the park perfectly located to make everything easily within walking distance. Who else could this be but ex Devonport potter, Barry Brickell. 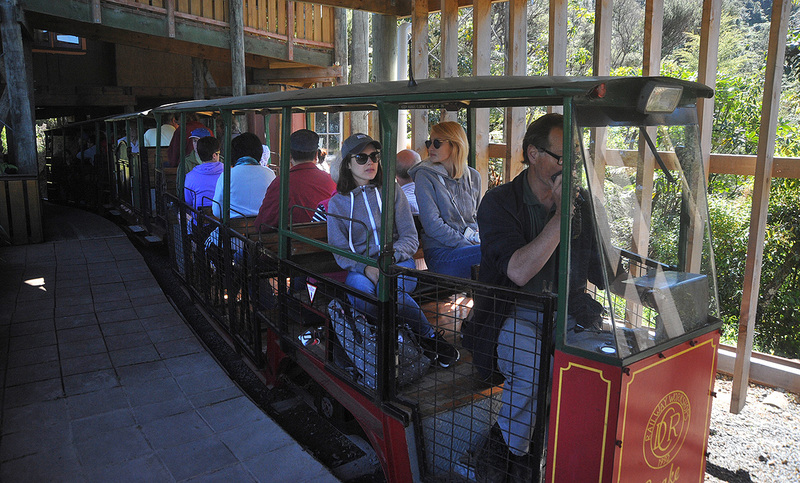 Unfortunately Barry passed away last year but his Driving Creek Railway business still lives on. It is an amazing example of what can be achieved by someone with an idea and the drive to see it happen. He spent years building up his railway, even making his own trains and designing his own propulsion system using small diesels and hydraulics on the wheels making it very efficient. 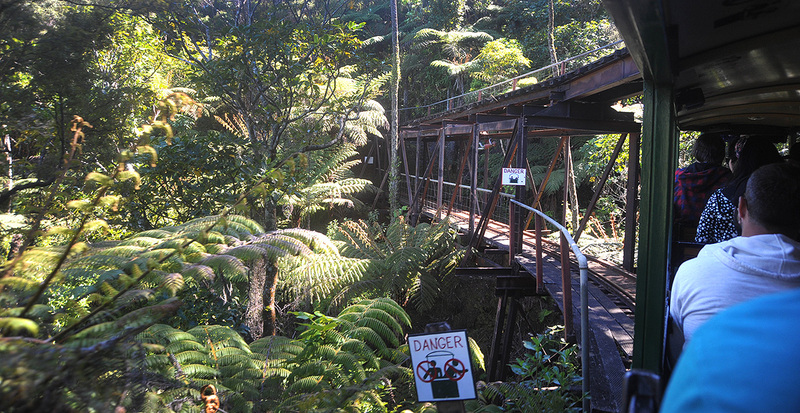 Driving Creek Railway is in Coromandel and has easy parking for Motorhomes too but best to get there early for easier parking. The train ride takes about an hour and works its way up to the Eyeful tower at the top where there is a fantastic view over Coromandel and across to Waiheke Island. As you go to the top, you cross a couple of viaducts, one of them a double decker. 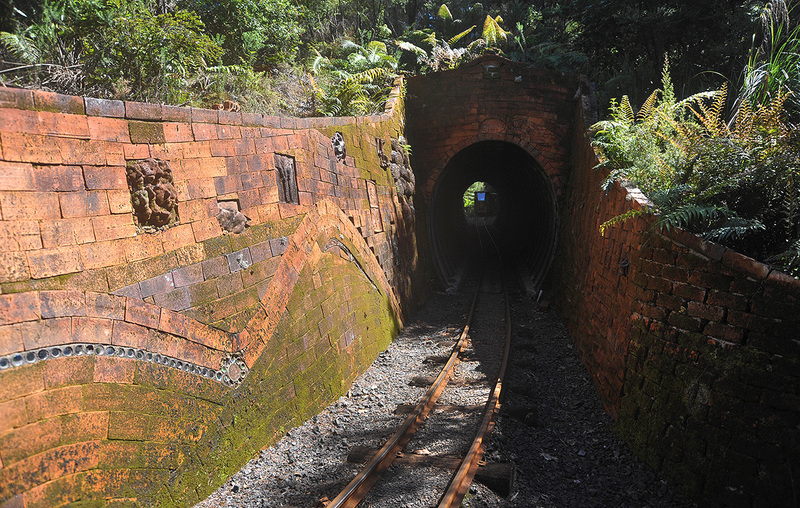 There are several tunnels one of which is lined with pottery tiles made on site. There are also several retaining walls made with Barry’s left over wine bottles. Its great to see they’ve got an extra life apart from just holding the contents. A fantastic achievement that is also now a great tourist attraction. You can also buy some nice pottery and souvenirs there too. One of our favorite parks that we use a lot too, is Ardmore by the airfield. Its a great park and usually full of some interesting people as well. We were on our way to Coromandel with our friends Rob, Helen and Chloe and to avoid the morning traffic we checked in with Rafe and their Tracker for the night. We arrived first and soon after we found we were next to another Dethleffs, some people that that we’d met some months ago, Liz and Dave in their Esprit. It was time for a drink so they came over to Rafe and soon after Rob, Helen and Chloe arrived and joined in too. The biggest thing about Ardmore now is the massive amount of gravel that now covers the old grass area at the back. What a huge difference it makes and also extends the useable area of the park. Its level too which is great. Well done to those who make it such a great park. 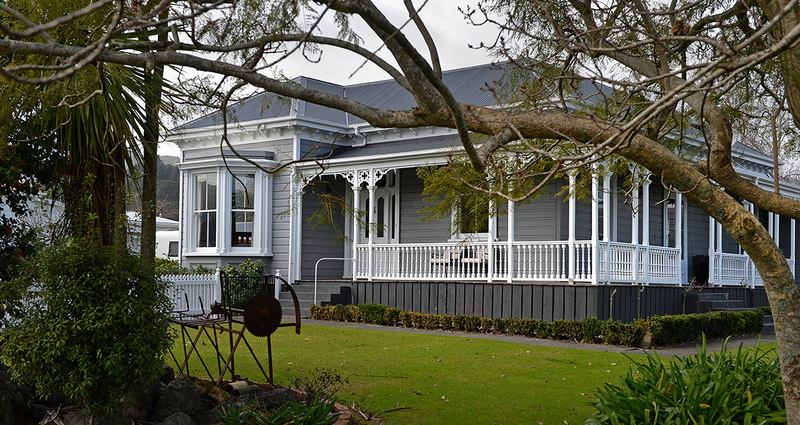 We had a great night there and in the morning were up early to get away to Coromandel. There’s nothing quite like a great welcome when you first arrive to check in for a spot in a Holiday Park. 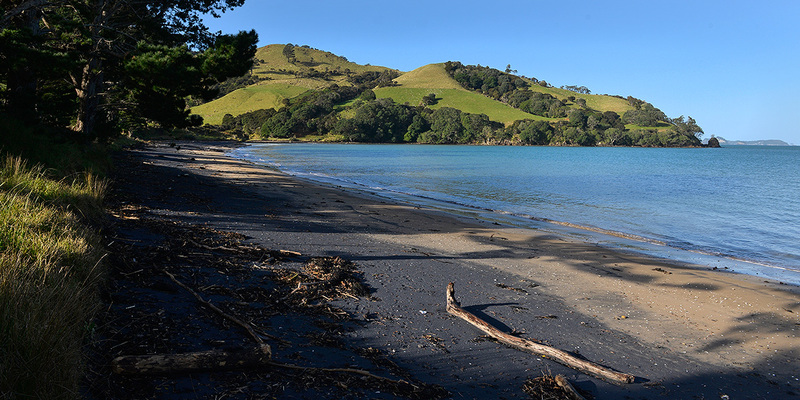 Helen and Trevor have been managing Coromandel Top 10 Holiday Park for the owners while they take a break overseas. Due to the huge amounts of rain, the grass was a muddy bog and everyone was huddled in a corner on the tar seal. There had been a few towed out that morning and more were rescued over the next few days ! I was given a nice park on Gravel with plenty of room around me with nice hedges separating the parking spots. Dump station just opposite and easy to get a big Motorhome into. There is a heated swimming pool which some brave people were swimming in when I arrived back from a walk into town and it wasn’t a warm summer night either! The pool was warm but the lights were off and they’d forgotten about towels too. They were having fun with their children who were in too. 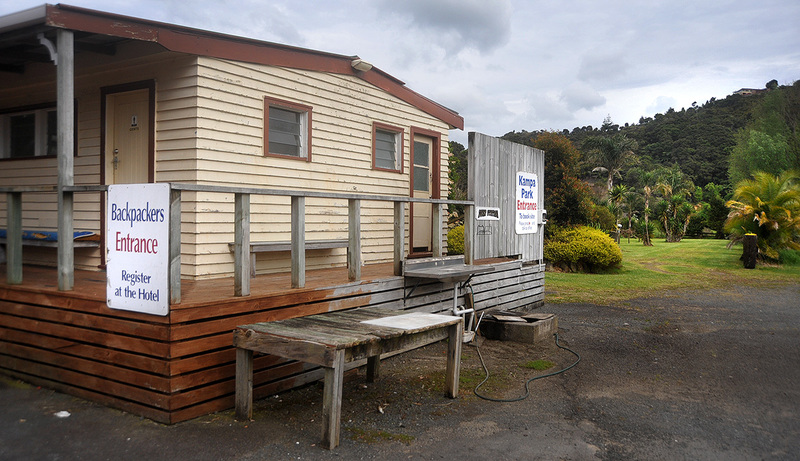 I was on my own and with winter rates it was $22 a night with power and the use of everything which I thought was pretty good for an effortless couple of nights in a clean and well kept Holiday Park. The kids in the park on Saturday certainly enjoyed it. Leaving Thames after a great few days cruising around the Coromandel Peninsula with plenty of time of my hands. 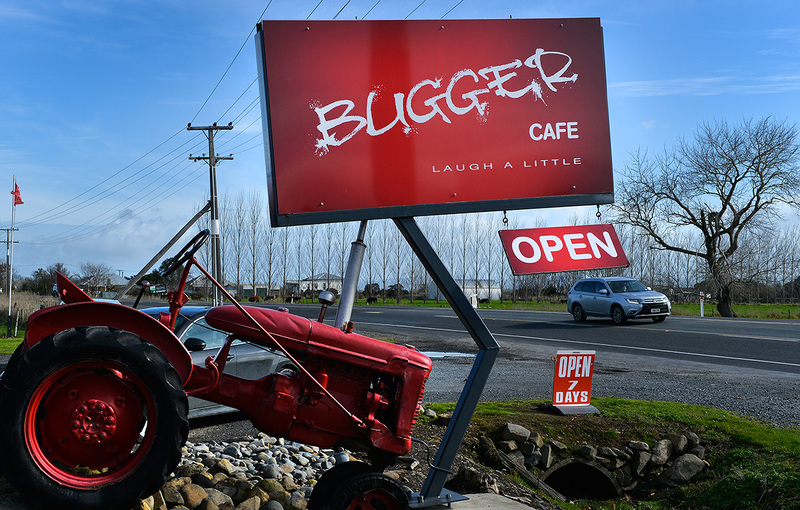 I had all day to get home but just before Pipiroa, I started seeing signs for the Bugger café. Well with the Toyota Bugger ad having just been judged one of the all time top ads and the name of this blog, I just had to stop and check it out and I wasn’t to be disappointed. A huge carpark in front and although it was busy with cars, there were plenty of big spaces to make easy parking for a large motorhome like Rafe. I stopped to take some piccies outside and wandered in to a big cheery welcome from owner, Glenda and her team.. nothing beats a great welcome. Nice food, nice people, reasonable pricing and lots of Bugger bits around the wall encouraging good humour. Their line is “Laugh a little” which you can see everywhere and its infectious. I bought a Bugger Tshirt and a Bugger Motorhome Rug called the Bugger Rug for Fiona. Lots of fun and neat people. 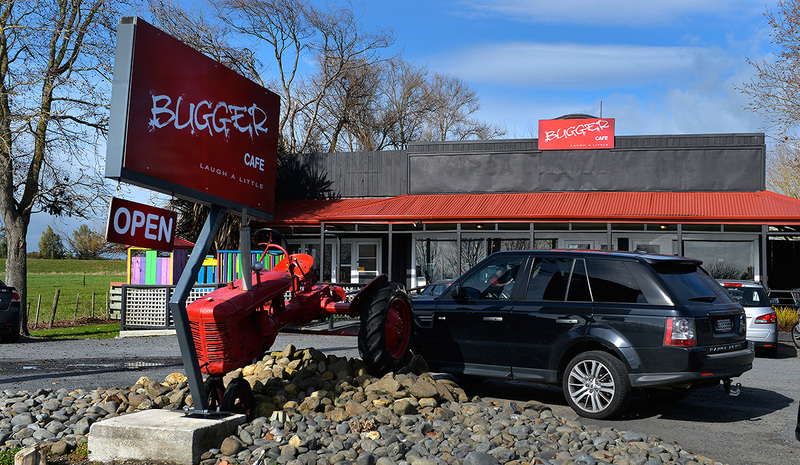 Glenda and John also have a Bugger café in Tirau. It doesn’t get much better than this. In a great spot, perfectly flat parking, Power, Water, a very handy bar if you need one and cooked dinner next to a Golf course and Mini Golf.. where? 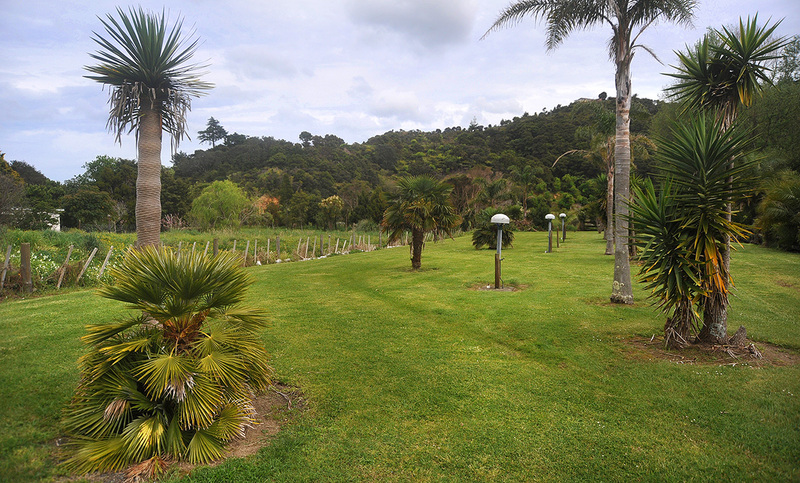 At the Pauanui Club. And only $8 a day for parking with the power and access to the loos. I was on my last night after doing the round trip from Thames via Coromandel and Whitianga meeting heaps of neat new people and catching up with some old friends too. A great few days. 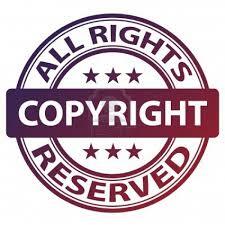 So its nice to kick back, plug in and make it easy. The grass is really well drained and is solid so I have no worries about the rain or it getting muddy. We’ve stayed here before earlier this year when it was warmer and I’ve also done a blog on it. Its worth having a look at the last blog as it was done in summer and there were a few more people around. Since my last visit, the water has been finished off at the parking spots and it’s all looking good. The club is a magic spot, they’re friendly helpful people and with a bike, from here it’s not far to anywhere. As I left Coromandel, I popped down to the NZMCA park to say goodbye to several friends in different Motorhomes and Caravans. I had a plan to go around to the eastern side and head down towards Pauanui or Whitianga. As I checked out with my new friends from Christchurch, Rory and Henny, they were heading that way too and were happy for me to tag along so we were off to Whitianga. I had made a loose arrangement to catch up with a new Dethleffs White Magic owner Paul and his wife Judith. The White Magic is the new version of the Globe 4 like ours but with a few different options and I was keen to see both them and their new van. 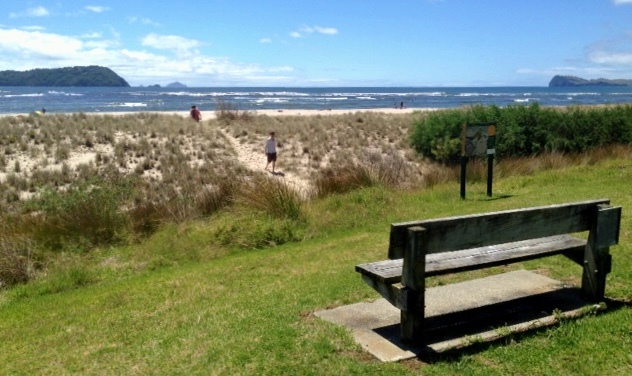 After a windblown crossing of the hills above Coromandel I stopped at The Esplanade at Whitianga for a cup of coffee and Paul and Judith arrived not long after. I had another cup of coffee with them and after lots of swapping notes, they went for a walk into town, so I headed back to Simpsons Beach Camp where I was going meet up with the Rory, Henny, Dave and Karen in their caravans. This camp is owned by an elderly couple, the Simpsons, who donate the $10 charge they make per night to a charity of their choice every year and it is just a fantastic spot right on a great beach. There is fresh rain water available and a black water only dump station. Its just a magic spot and a great swimming beach in summer. .. or winter if you’re brave! We were sharing the area with a lot of Sheep, so the only thing we had to watch for between Motorhomes and Caravans was sheep poo and there was plenty of it ! Paul and Judith popped in to see Simpsons Beach to check it out for a future stay and agreed, it was a lovely spot but they were committed to carry on to Matarangi for the night. It was great to see them. As this blog had just hit the 100, 000 hits mark at 5.00am that morning, I was keen to crack open a nice Italian red and celebrate with them. At around 4:30, we had a few drinks in Rafe as the showers rolled through. A couple of hours later, I cooked up a lovely steak before Rory summoned be by phone from next door, so they could teach me a new game of cards they all played. I cant quite remember the name of it.. 10 something but it doesn’t have suites and is a little like snap without the snap 🙂 A great game and they were great company. The next morning was time for lots of cups of coffee and walking. It is such a great spot. Rory, Henny along with Dave and Karen were heading to Hot Water beach and invited me to go too, but with only one night left before Fiona came home, I thought I’d head to Pauanui for the night as it was that little bit closer to home and its nice to plug in as well. Its not the first time I’ve stayed here before in summer and it never disappoints. One of the main reasons for my trip to Coromandel was to be part of this amazing event. 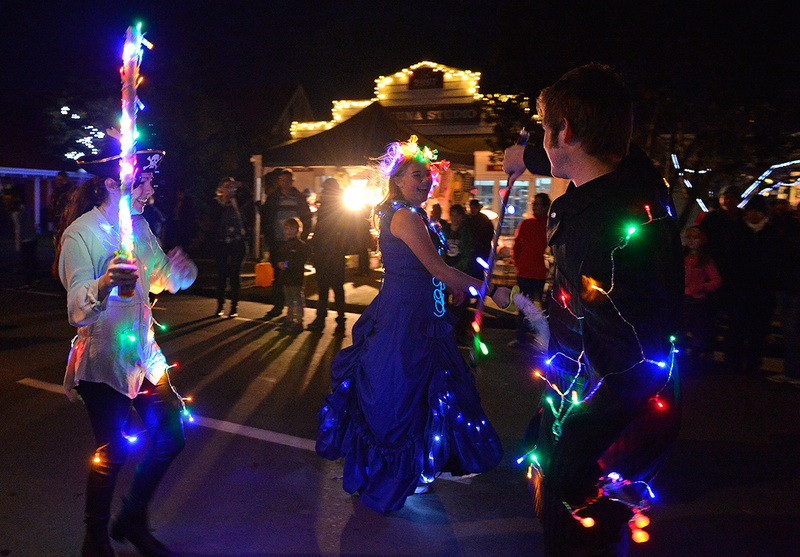 The Thames Coromandel District Council had arranged along with locals, to run this annual event on two nights. It has become an annual event but this year by all accounts, is much bigger. The theme was “light” where people wore lights, the buildings were lit up, some of the trees, vehicles, the local kids and there was also live music in a marquee set up in the middle of the town. The whole community was involved. A great scene. retailers had market stalls setup outside their shops. 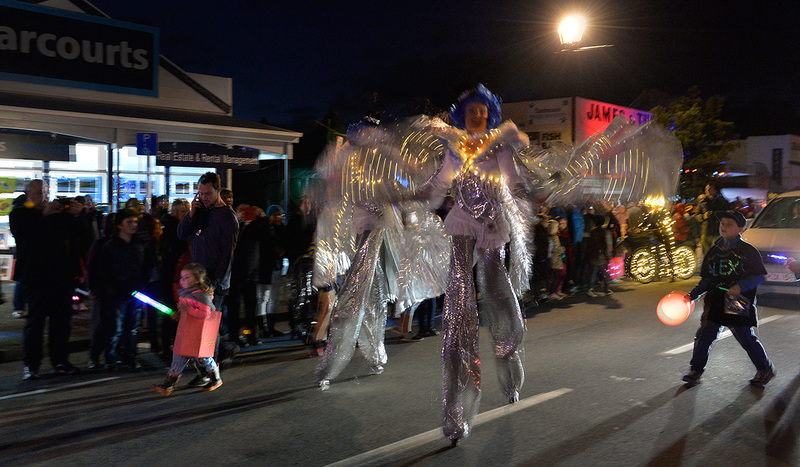 There were people with lit hula hoops, juggling and later there was a parade of lights led by the local Fire Brigade. The local preschool kids were all lit up along with bike riders and dancers. The event finale was a huge fireworks display which you could see and hear from everywhere. Spectacular and I’m pleased I didn’t miss it. After meeting my new friends from Christchurch, Rory and Henny and their friends Dave and Karen, I made a point of making sure that at some stage during the day, I should pop down to the NZMCA park and have a cup of tea with them and a catch up. 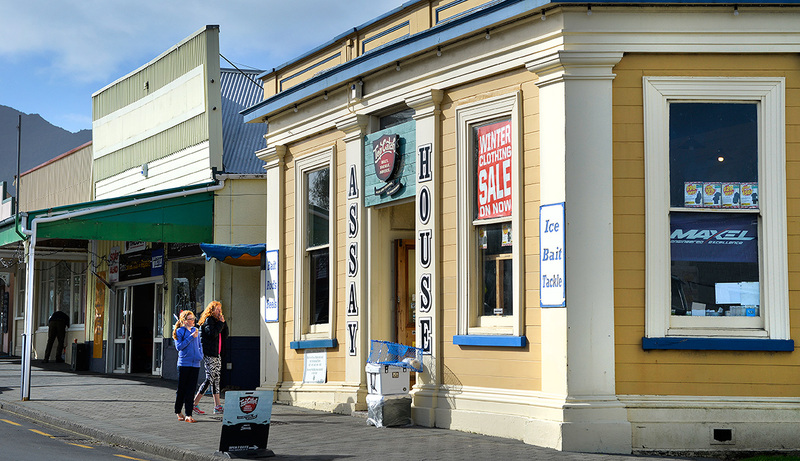 I set off reasonably early on my bike with my camera tucked down inside my coat and made my way down to the other end of Coromandel town. The shops and buildings are fascinating and you can feel a real vibe about the place. 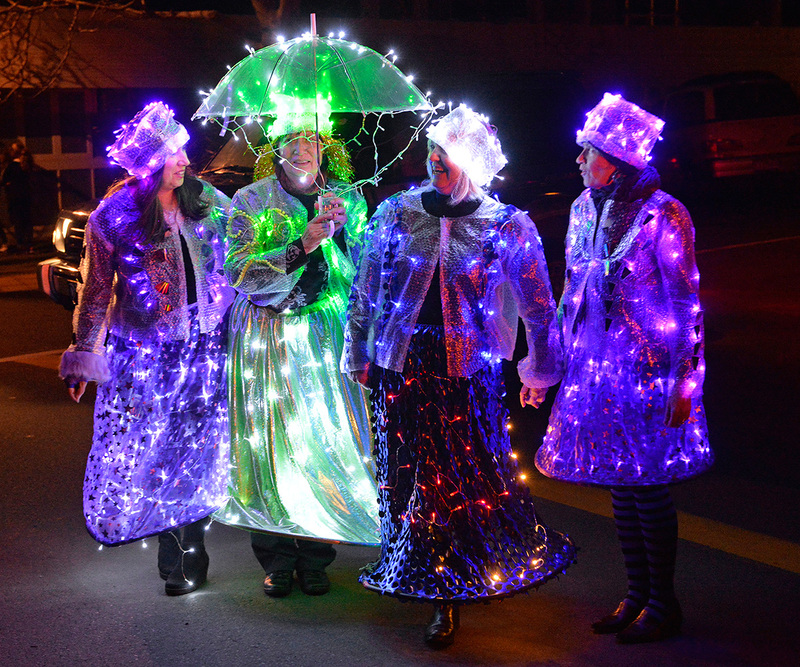 They were getting really for the Illume parade and event that night so it was even more buzzy than normal. The free parkingover the road from the Police Station ..Handy! After getting some nice piccies and talking to a couple of the locals, I biked around to the wharf and then back to the NZMCA park where I caught up Rory and Henny and with typical South Island hospitality was just in time for some of Henny’s lovely homemade scones and a cup of coffee. We had a great hour or two talking about everything and they’re great fun and good company. 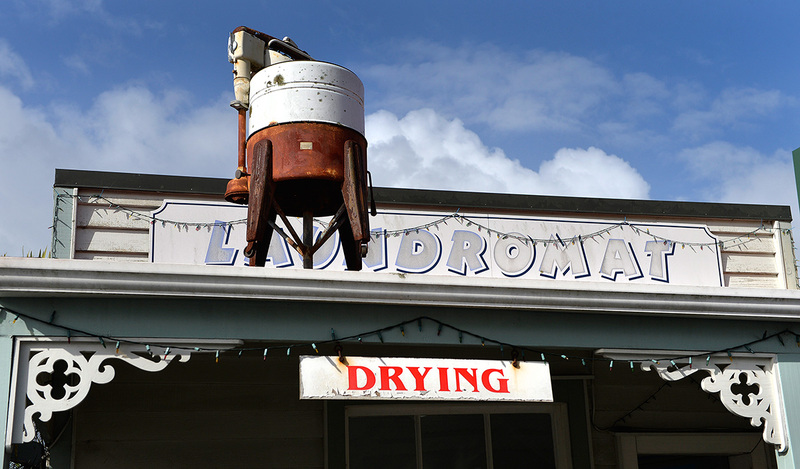 Its easy to tell where the Laundromat is ! I biked back, checked out the campground and blobbed out with the stereo before hittting the sack early to get ready for another big day. 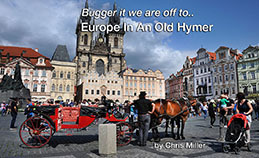 A neat place to visit, some great places to stay and despite the weather, plenty to do and see.